Are you looking for the best facial wipes for dry skin? I have the worst dry skin especially in the winter. My face is dry. My hands and feet get so dry they actually crack and bleed. I suppose it’s because I am outdoors doing chores in the cold air. I don’t know. I keep everything covered but it still gets dry. I have tried so many products without many actually working well. I can honestly say, I have finally found the best facial wipes for my dry skin! 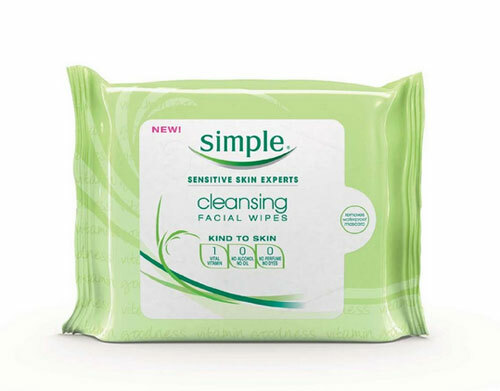 Simple Cleansing Facial Wipes are my new favorite beauty product! Of course, they clean my face. I have always been a soap and water kind of girl. I’ve never had an oily face or pimples much. I have always washed my face when I wake up and before going to bed. I’ve tried tons of different moisturizers. I have a few favorites but my skin always ends up dry within a few hours. Yes, I drink tons of water. I’ve started wiping my face with these morning and night. They actually leave it feeling so moisturized. My face has never felt better! These weren’t given to me to review. I actually just wanted to share how great they are on my face and hopefully someone else will enjoy them as much as I do. The wipes cleanse, refresh and nourish your skin. They can remove eye make-up and even pesky waterproof mascara! They are 100% alcohol and oil free and tonains Pro-Vitamin B5. They are suitable for all skin types, especially sensitive skin. The best part is that they contain no dyes, no artificial perfumes and no harsh irritants that can upset your skin. I’m sure you can grab them at any local Wal-Mart or other store. They’re also available online ! Do you use these wipes? If so, do you love them as much as I do? What’s your favorite facial wipe? I bought simple a couple months ago for my dry skin and I loved it. I use it 2 times a day. I have extremely dry skin and these are the only wipes that I buy. I love their softness and they help my skin stay soft. I use them once a day at bedtime. i love these wipes and i have extremly dry skin!! these dont bother me at!!! These wipes sound amazing, I have the worst dry skin. Definitely switching from my current wipes to these ones. I have been curious about these wipes myself. Most break my skin out or dry it out. The Neutragena ones are not too bad but can be pricey. I have a coupon for the Simple ones so I must give them a try-thanks! I like that they seem gentle on the skin but can remove the tough makeup too. I don’t really have dry skin but my sister does and I’m going to suggest this product to her. I have tried this for removing makeup but did not notice whether it helped my dry skin. I think I should give them another go! Thanks for sharing. I was really surprised at how moisturized it made my face feel and I am still using them morning and night 🙂 Love them! Definitely one of my favorite beauty products ever! These wipes sound amazing, thanks! My face is similar to yours. No matter what moisturizer I use it seems like it is still dry. I will have to try these wipes. Thanks for the review. I am loving the simple brand right now. But I have yet to use the wipes. I am so glad you posted this great review. I am definitely going to use the Simple wipes now. I usually use the neutrogena face wipes. They are very good, but I want to try there now. Eye make up is so hard to get out. These are probably my favorite facial wipes of all time! I use them everyday and they always leave my skin feeling clean and refreshed. I have pretty sensitive skin, although not necessarily dry, but these wipes are perfect for me. I love that they don’t have a strong scent as well.